A twelve-inch ruler, with tactile markings every sixteenth of an inch. Excellent if you like very exact measurements. 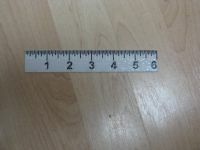 A six-inch ruler, with tactile markings every eighth of an inch. This is our ultra-portable model for students on the go - and travelers who like to be prepared. Tactile markings and both print and Braille numbers. Features bendable plastic so you can easily measure angles. Choose from the 12" or 6" size. Have you ever tried measuring around corners with a hard-plastic ruler? It doesn't work too well. Plus, though our classic rulers are great for blind folks, the lack of print on them makes them a poor choice for those with low vision. Our new Print Braille Ruler solves both these issues. First, it's made of a bendable, plastic material, meaning your new ruler is flexible enough to measure around angles but strong enough that it won't break with use. Tactile markings insure an accurate measurement, even up to 1/8 of an inch. Last but not least, the ruler sports both raised Braille and large print numbers, so everyone will be able to use it without counting lines and guessing at results.